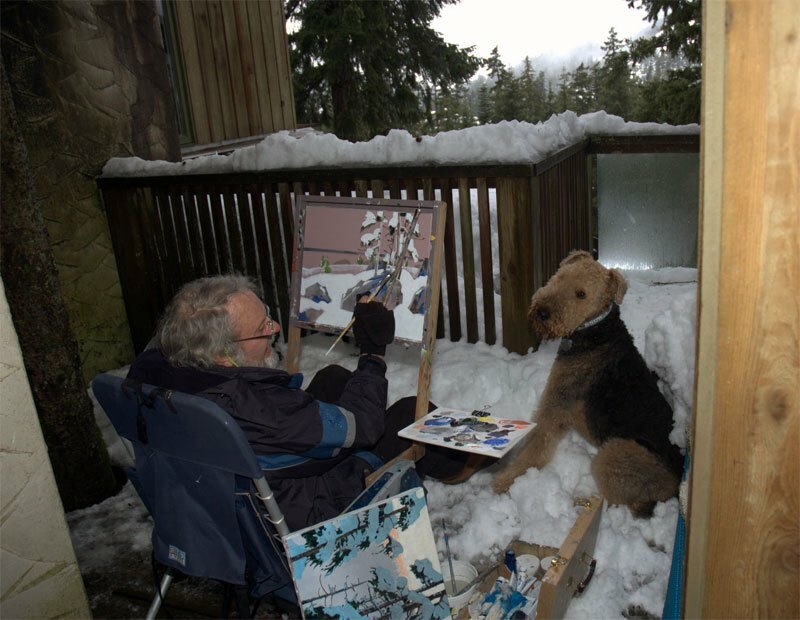 For the last few days I’ve been painting on a particularly frigid balcony at Whistler, B.C., Canada. You may know that Whistler is the site of the 2010 Winter Olympics. The main currency around here is snow, and this year there’s lots of it — great clods of it fall from the trees as weight builds and more sifts down from leaden skies. It’s bitterly cold. These gloves are the kind with the open fingers and mitten-type covers. Stanley has his own excellent coat that he wears both indoors and out. Even while bundled up, I have to keep coming inside for a sip of coffee or something stronger. Sometimes I have to warm up with dreams before I can go back to my balcony. If you try this sort of thing at home, my guess is you’ll paint looser and fresher. Funnily, in sub-zero it’s easier to be hot, partly because you need to get on with it. Further, forced to come and go, another part of you makes you take your time. You size things up and try to decide what comes next. Actually, change of any sort refreshes and sharpens events. I don’t want to be maudlin, but the frequent-pause system can reboot life. Working in acrylics, I bring incomplete work inside to the heater. I work on several paintings at a time. While the balcony view is ever changing, I also rerun images from cold sorties down snowbound lanes or from glimpses through a fogged windscreen on the way to groceries. Right now there are no boisterous sports fans in Whistler. It’s a strangely quiet winter wonderland where even a foraging chickadee is a minor miracle. In the evening, by the fireplace, as the snow continues silently outside, the accumulated work goes under the lights. It’s here that some paintings win you over and shout “Stop!” Others decay in front of you, becoming objects of disgust and reminding you of your chronic failings. Sleep finally arrives and you sink into that pervasive dream that you may live to once more repeat the process. Tomorrow will be another day. Esoterica: Winter work is both inconvenient and miraculous. Mittens or gloves, no matter how well designed, are never quite as fine as fingers. In blown snow, the acrylic palette never dries. Taking boots on and off is a pain. The sense of holiday — away from the home studio — is at once energizing and challenging. The work can often seem more exciting. One marvels that a life can be built around such a low-tech workstation, however chilly. And unlike this travelling laptop on which I’m writing you, when it breaks down, I can fix it myself. One of the first things I learned in formal training was to “clear the eyes.” I, too, must forcefully pull myself away from the easel. Sometimes, when my cheeks are burning with excitement from painting ( good or bad! ), when I can hardly breathe, I make myself drop the brush immediately and stroll away or lean back and relax and definitely look away. It’s necessary for the rods and cones. Sometimes at frequent intervals if I’m not too caught up in the zone… We learn to be patient, whether we want to or not! We need to pace the flow of the paint. Fresh eyes are a necessary tool! Hi Toni — this is such good advice and sometimes so hard to follow. I’m a beginner in the world of watercolour. I frequently get lost in my painting, then suddenly come back to myself to find that I’m breathing in short, impatient breaths, my heart rate is up, I’m gripping the brush in white-knuckled excitement (or fury). It’s always best to put down the brush, breathe deeply, stand up, stretch, relax, WALK AWAY from the painting — but it’s oh so hard to do that! I suppose I’ve been using the “frequent-pause system” for years (even though I have a nice cozy warm studio), but thinking it was laziness I was trying to stop it. Now, perhaps, I realize it’s been a way of refreshing my mind and body so I could keep the quality of work high. 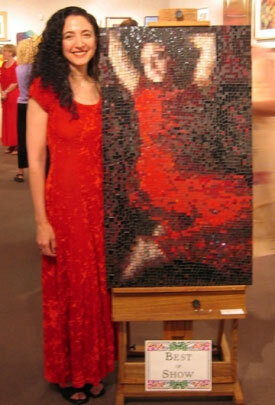 I typically paint for an hour or so and then leave the studio to go do something else for ten or fifteen minutes. Then I go back to the studio and paint again for an hour or maybe two. This means fewer hours actually at the easel than if I was to stand or sit there steadily all day, but maybe the enjoyment and the quality would wane. If I worked steadily I might find I had actually produced less good work in a day than I do by taking all these breaks. 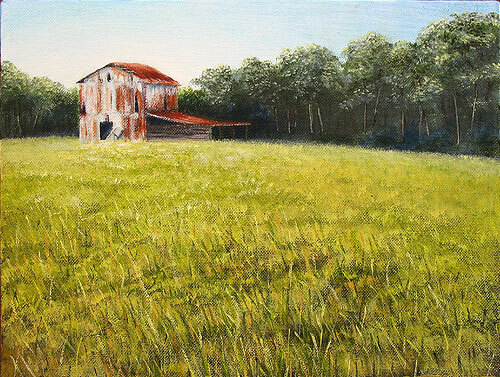 I started painting outdoors in the ’60s, maybe late ’50s. I find that if I paint standing up, then I am using my whole arm and can paint with lined gloves or even mitts, which my fingers’ poor circulation requires. (My best painting gloves are rabbit-fur lined which I got at the SalvationArmy; I bless whoever got rid of them.) Sitting requires small-muscle control of the brush and then one’s fingers do need to be exposed. I find sitting gives too much cold-loss as the insulating air in my clothing is too compressed across my seat and back to protect me well. Although I can be cozy sitting if I can offset this heat loss by sitting on a reflective blanket — those emergency or ‘space’ blankets — but these still need help from added padding (a windproof cushion) to slow down convection as well as radiation…just like keeping the heat in a house. Stop heat loss through air movement (that’s what insulation does) as well as radiation (what night curtains on windows do). Standing also takes a little more energy and keeps blood circulating a little better. You are likely to step back to view your work more frequently if you are already standing and that helps your circulation as well as your painting. Also, standing on a sheet of insulating paneling, such as Homosote brand board, or even wood paneling, gives one more of a barrier to losing heat from your feet. Every time I go out my painting takes on a new freshness and the colour sensitivity grows. We use a buddy system and that is key to our version of the frequent pause system. After stopping on an unpaved road we get out and survey the spot. As we set up we make a judgment as to how many minutes the day is — and we set the clock (cooking timer) to ring at that interval. When the clock goes off we get in the car for a warm up, talk, and a few laughs. Then it is out for round two. This is when the weakness of the system can rear its head. If (when) we forget to set the clock, we often freeze up before we are aware of it so the warm up interval grows appropriately. In this picture Vic Sullivan demonstrates the bare hand approach — not recommended and not often practiced. Like you we get keepers, workers and skimmers. I get cold reading about you brave painters in the frozen North. It is too cold here in Central Florida at 60 degrees for me to even think of venturing out. My hat is off to you. A warm one, too. At the risk of sending the price of this article beyond purchase, have to tell you Robert, you need snow pants. I live on a farm and there’s almost no heat… I have a small coal stove in the kitchen that heats my whole place (and me). It’s currently 6 degrees Fahrenheit outside my window on the world. The secret is… the snow pants keep you warm outside (unbelievably so) and you don’t overheat when you go inside. You keep them on all day: no time lost changing in/out, in/ out. My studio is cold (a small propane heater) but I can still paint all winter in 40 degree temperatures, a lot of times without gloves — the pants just keep your whole self warm. I get in them around November and I’m still in them come April. I have several pair. I wear them to town, to art openings and even sometimes to bed if it’s really cold. I will leave it to others to tip toe around, shivering and holding themselves, bent over at a 45 degree angle, blue lips and white hands. I traded off normal clothing years ago and I have never looked back. Get warm …. $29 – $69 and most thrift shops sell used ones. I also live in an old drafty house. I use long underwear throughout the cold seasons. Not the thick, bunched up cotton type, but the thin stretchy type found in sporting goods stores. These are amazing! and don’t forget merino wool socks! but I have to ask — your snow pants — you are not talking of those slick poufy things I send my kids out to play in? not sure I’d be brave enough to go thru an art opening in those! the warm pants I wear now, (1 degree outside) are overalls and are lined overalls and waterproof usually sold to outdoor workers or Hunters. These are incredible for warmth and marino wool sweaters, not thick, but thin are also fantastic to make one very warm. I have used them flyfishing for 6 hours in 30 deg weather and snow standing in a stream for six hours — no problem!!!! I have read on several conservation websites that acrylics are not stable below freezing and can crack. Based on your Whistler experience your efforts seem to refute this concept. Any thoughts on the subject? (RG note) Thanks Duane. You’re right, Acrylics and their media become granular and unusable if they happen to freeze. I bring the box inside every night. The palette is renewed each morning. A bucket of paint-water left overnight was suitable to skate over. I have the (bad?) habit of leaving brushes in water — nice collars were ringed around the handles. 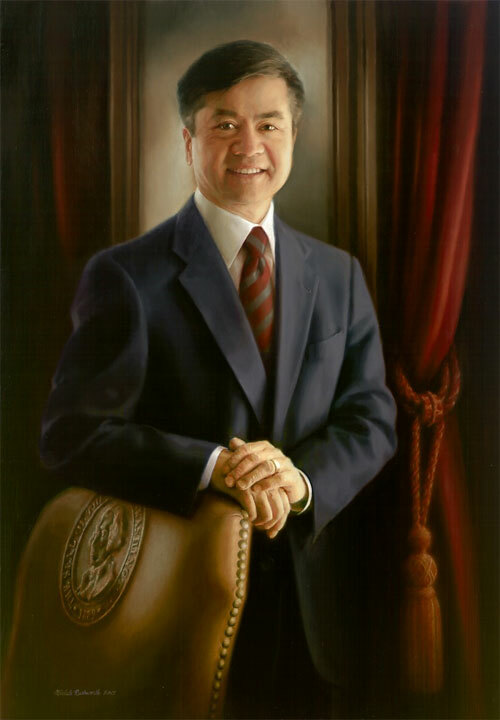 As mentioned in the letter, the paintings are soon brought inside to cure in normal temperatures. Oil painters are relieved of most of this fuss. What kind of a rig did you use in the Whistler porch picture? I mean the easel and palette holder. The only item missing is the glass of wine. Love reading your stuff. (RG note) Thanks, Jim. That “rig” is a homemade item that attaches to a folding chair. It folds up, goes into the back of a car, takes anything below a 14 x 18, and is remarkably difficult to get into and out of. You can see it in action in a video here. (YouTube video can be accessed from this clickback which includes description and stills). Some of us aren’t comfortable with uncertainty. We like the familiarity of routine and sameness. There is great value in tradition, in making memories in the same places, in a trusted palette. We walk sure-footed and with confidence. We become teachers of our knowledge, sure of our path. We have answers to questions. We shuck and jive with experts, like ourselves. There is equal value in falling flat on one’s face. The pitfall of complete comfort is the pathway to death. There is no more growth, no more learning. Our minds become lazy, our spirits practice apathy and when change comes (and it will come) we are devastated. We can choose to hide or blame someone or make some sort of decree of gloom and doom for the world at large, OR we can remove any shame or embarrassment, stand up and laugh. “I’m all right. I’m all right,” we can tell those concerned for us. “I need to take another look at this,” we can assure them. At the moment we make the choice to help ourselves, we also restore dignity and prove how intelligent and resourceful we are to those who are looking. Best of all, we take one Giant Step (Mother may I?) forward. I haven’t always felt this way about inconvenience and “setbacks.” I have blamed and shouted to the heavens, “Why ME?!! !” Frustration became so overpowering, I have destroyed things around me. Most damaging is Irritation. It lives under the skin, shallow and petty, and its host doesn’t see how degrading Irritation can be. The difference between capitalizing on inconvenience and being destroyed by it is perspective and choice. We can practice seeing more than the initial picture. We can take the time to imagine how we can benefit. We can turn the puzzle piece a different way to fit this new picture. I can only speak for myself when I say that EVERY time inconvenience has happened, when I allowed it, something better was created! This was an exceptionally wise letter. I immediately went back to the beginning and read it again. It’s stuff we all know deep down in our gut, but push the realization aside because it doesn’t support our self-pity. Thank you Kittie. Management of energy rather than time is one of the concepts in the popular book The Power of Full Engagement. They studied how the very best athletes managed their energies. Even between swings, they had mini rests… staring at their racquet strings, etc. They didn’t try to be “ON” all the time. Scheduling restorative rituals through the day helps to keep people’s minds sharp. Lea, what medium is this? Stunning. Thank you. It’s stained glass mosaic. It’s about 7:30 a.m. here in northern Nova Scotia and a cool -19 degrees Celsius outside. Warm in my studio, I look out towards the East and watch the sunrise, it changes in fleeting moments from deep red to orange and finally to yellow intertwined with warm winter greys. I cherish these mornings, it seems that everywhere outside becomes wilderness and no matter where I venture into the woods when there is a deep blanket of snow down, there is never a soul to be seen. Then there is the silence, a quiet so profound your ears whine, not used to the stillness that seems so natural in the forest at this time of year, with perhaps the exception of the sharp crack of a tree giving way to the frost as it splits another frozen trunk. In about an hour a film maker will be arriving to venture with me into the deep woods of Whitehill. I have perhaps 2 miles of snow shoeing trails winding through the Acadian hardwood forest, now buried under almost a meter of the white stuff. Stuart is from England and this will be his first foray into such a place on snow shoes carrying a $12,000 camera! We are nearing the end of filming a documentary he is calling, “Painting The Wilderness.” A film that has taken us from one end of Eastern Canada to the other. Today though will be the real test. On days so cold it is virtually impossible to paint on location, I prefer to sketch with my camera, picking out areas of interest, looking, seeing, feeling and just being in the woods this time of year. 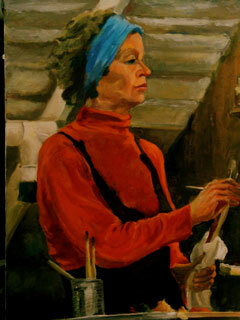 It is as important to my work as the discipline of sitting at the easel every day. Without this constant interaction with nature my artist’s soul withers. It won’t be long though, perhaps just eight weeks, and I will once again be outside working on location next to breaking up rivers, hearing the wild chorus of spring. Stuart is arriving now, the light is wonderful, warm and wintery, soft shadows, and every branch on every tree carries its weight in great white cotton balls.. perfect! You have a poetic soul Mark and it shows in your work! Please let us know when the film is completed, and how we can view it. Please email me the web site for viewing the film. 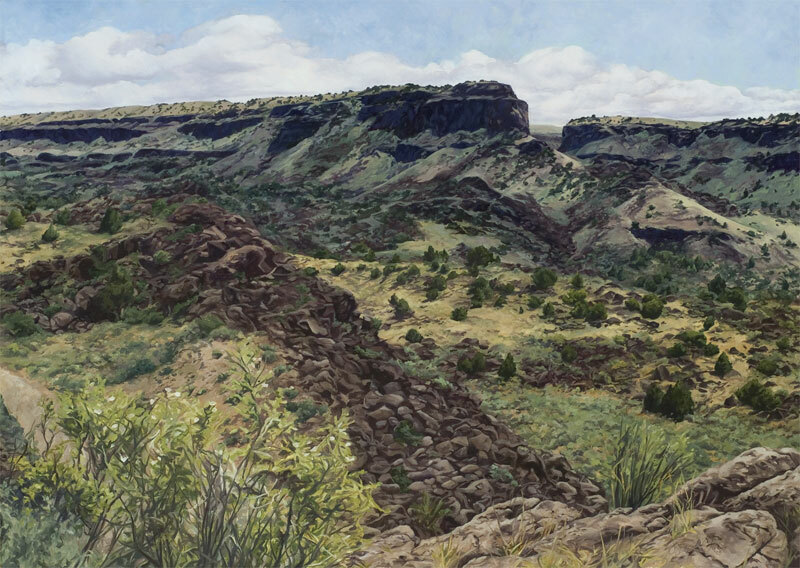 My most exciting balcony painting came when I attempted to paint a storm coming through Mesa Verde. I knew my time was short. I hustled not in and out but to get hold of anything that would suggest the awesome power and immensity of the blue-black clouds rolling toward me. I was forced inside by incredible wind and then torrential rain. I did not finish that one, but I still have it because I love the energy of it. I could never go back into it without ruining that energy. Later, with greater skill my memory could have helped me with it and trust that my training would show up and confidently recall that energy and speed. Those of us who tend to paint slowly and methodically, do a better job when forced to increase our speed and focus on the matter at hand. There is no time for second guessing and self-consciousness. We move to the “auto-pilot” part of our brain where our skill takes over and gets the job done. I think we do a better job when we are forced to function this way. Design work, drawing and planning prior to the painting experience itself is what we do in our sketchbooks daily. Working this way is no guarantee of success, but it certainly is exciting trying. Living here we don’t get a lot of snow. I would love to try it sometime. I know that oil paint becomes pretty thick and does not behave very well when snow flakes land on it. 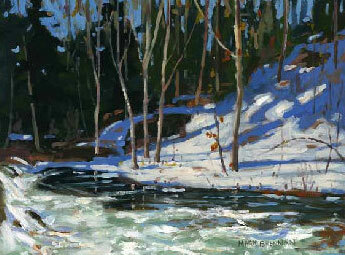 When studying with Neil Welliver, he said he painted outdoors in Maine in the winter. He said if it was snowing, he would cover himself and his easel with plastic sheeting and cut a hole to paint through, so the snow would not hit the palette, the canvas or him and it could slightly warm the air inside the “tent.” He must have had great boots and maybe those little warming packets that skiers use. Georgia O’Keeffe would bring a few rugs to stand on in chilly weather. I guess what it all boils down to in the end is how badly do we want this… what are we willing to do to make the paintings? I have to be better, I have to be the best, I have to find what’s missing; it’s my mission in life and possibly one day I’ll have the good fortune of life’s longing for itself to be found. Not every stroke is genius, that’s why they call it life, and I’m living mine. A quote from the bible, something along the lines of “When a man is fully taught from his teacher, he is not greater than his teacher, he is like his teacher.” I like that. I remain thoughtful of your letters and of snowflakes, water that clings and puddles that can be splashed by the surprise of a child. 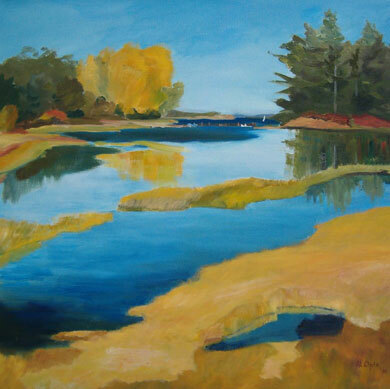 I do water color paintings, mostly landscape detail work, and enjoy seeing effects of water and paint in different atmospheres. I can certainly relate to your enjoyment of running back and forth to your work and seeing the progress. Its cold here in the Laurentians. I recently saw watercolour works of Endel Ruberg that he did here and was amazed at the technique which I don’t fully understand (did he use wet paper?). His works are on permanent display in the Montreal Museum of fine Arts since 1979, but I had the pleasure of seeing his work up close in a friends home..it is truly amazing to see the frost affects in the paint and color. I am wondering if you are familiar with his work or technique of frost-patterned images in watercolor. He also worked in leather, won many awards, and there is a DVD made of his work. “Endel Ruberg’s walks in beauty”..which the Estonian National Foundation of Canada helped finance. An interesting man for sure. That’s exactly how I paint! My husband is very amused watching me beetle to and from the painting, getting close then moving back, making strokes and then a few more, then out of the studio for a cup of tea and a ‘ponder session’ and then back to the canvas for a few more strokes, etc. I’m happy to know that I’m not the only “beetler” out there. Interesting “rig” you have for the lawn chair. It looks like you are locked in there pretty well. Is there an easy escape device? 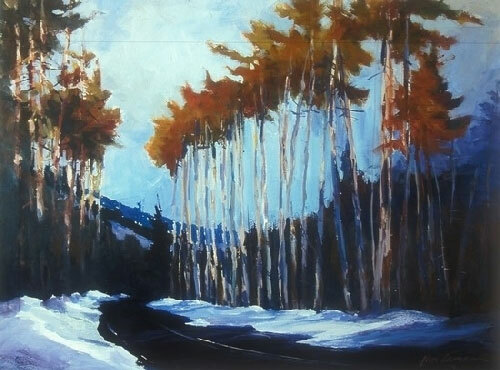 Hi Robert, I was interested to read your letter on painting outdoors at Whistler. A few years ago I backpacked on skis to Skokei Lodge near Lake Louise. 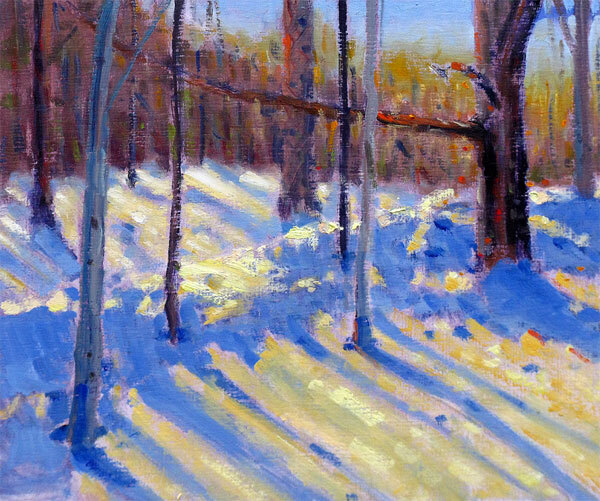 I painted exactly the way you describe it… in and out, warm up at the wood stove,a hot drink and and move out again. The temperature was about -20 so there was an sense of urgency present in the work. I know that I succeeded in capturing the light and the unbelievable beauty of this pristine area . The last plein aire work that I did was in November near Crescent Beach and there was not the comfort of easy access to shelter so we used thermal gloves to help keep fingers warm and also painted with the fingerless ones. I agree that you can never get this kind of strong light from a photograph or locked away in the comfort of your studio. Give me the studio any day. I don’t see going into nature except to photograph it or play in it. I don’t copy nature anyway, I interpret nature, I can do that in the comfort of some warmth, with hot coffee, good light and my dogs around my feet. I can also take my time, pause (in comfort) contemplate and then resume at my leisure. Ah! paradise! Fascinating story Robert, thank you – a good reminder that there is no one “correct” way of working. Part of finding your artistic voice and language, I believe, is finding what works best for you, be it materials, time, approach… and taking advantage of that, rather than bending yourself to fit a specific system (as long as you’re productive). I’ve known artists who could only work in intensive and incredibly focused fits between multiple tea and biscuit breaks, others who work 12-16 consecutive hours, and others (myself included) who drift between the two. It matters not how the tree grows, as long as it bears fruit. I love fingerless gloves with a mitten cover but I use polypropylene liner gloves beneath. They are thin enough to allow for drawing or painting or using binoculars yet are warmer than no gloves on the fingers and then you can pull the mitten cover over to warm up periodically.. Have you tried them? 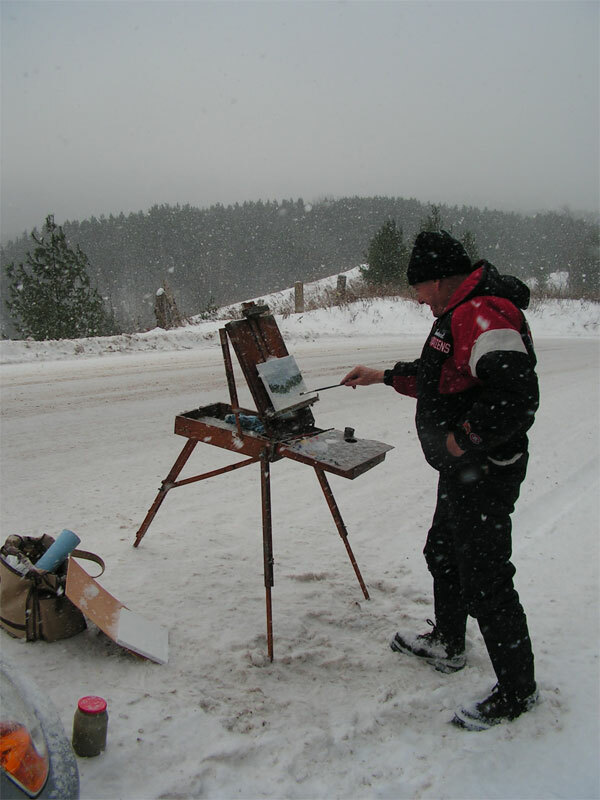 I am so envious of you…imagine being able to paint outside, to brave the elements, to have such fun! Makes me ashamed that I wait for a sunny day to enjoy myself and my painting. Never again…I’m going out today! And so many thanks for so much wonderful information and encouragement. Frequent pauses are welcome and necessary even indoors in the comfort of your studio. That is one of the reasons for giving your model a break every twenty minutes. Artist and model need to step back. Even when I’m doing a landscape from photos, getting up and walking out or around my studio is essential to get some distance from the piece. 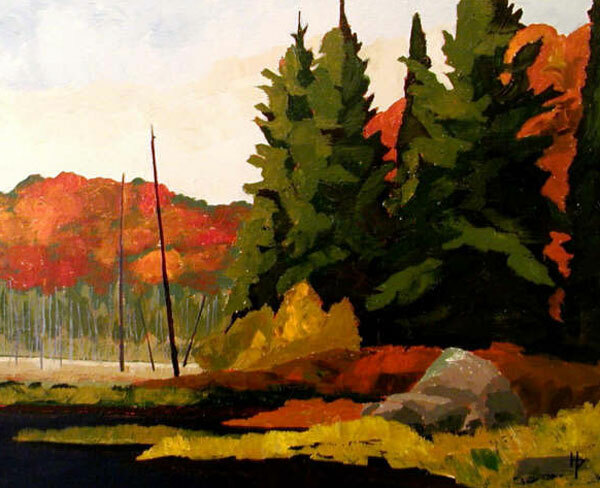 Personally I believe if you’re a novice and haven’t painted landscapes you need to get out into the sun. When after years of doing this, you decide the studio is for you, you will have gained the knowledge and experience to employ your ability and come up with a worthy piece indoors. Many great painters did their best work indoors based on experience and studies. I have sketched and painted in the cold and in pouring rain, although not often, as well as wind and sun and I think it brings much more to the interpretation of nature than working from a photograph and hopefully to the studio for other times when it is necessary to use photos. I had it said to me once by a dealer in Toronto, who has sadly passed, that we are (were) surrounded by too many fair weather painters . Working in the Northlands of Ontario, I personally wonder about it all especially when after warming my hands I notice that my Oils are not flowing . I guess I am agreeing that on and off working can allow for spontaneous resolution , but not when fighting the materials . I bet that Mr Genn warms his hands and paints at the same time (inside).